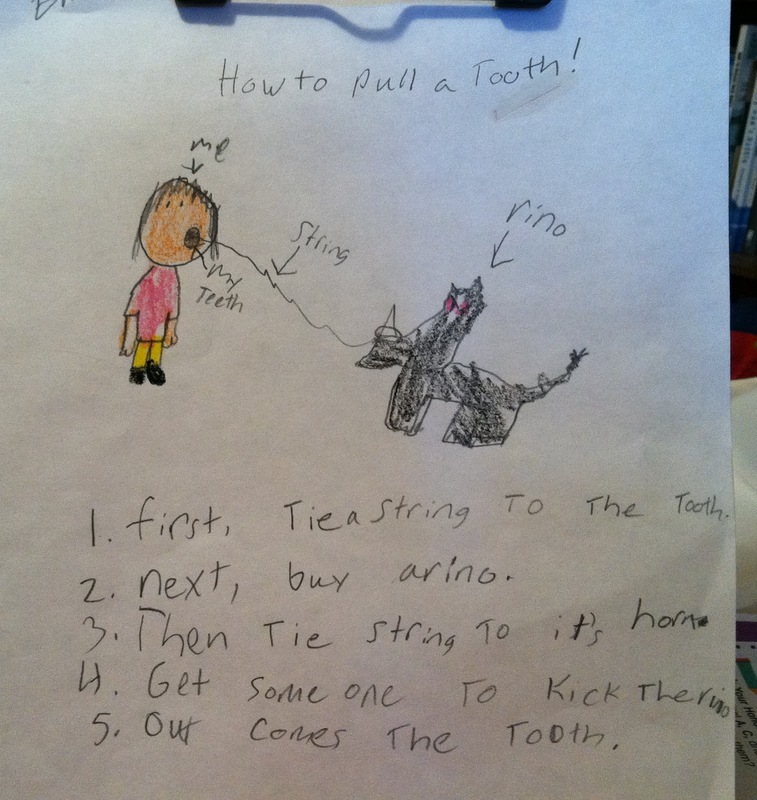 In case any of you are looking for a creative way to pull teeth (or a use for any rhinos that may be lurking around in your backyard) I thought I’d share Emma’s latest idea. I laughed out loud when I found this paper in Emma’s backpack. She walked into the room and asked what was so funny. I have to agree that Emma does know a lot about animals and she seems to be well on her way to her dream job of becoming a veterinarian. A few months ago she commented on how great it was going to be to have her own holiday, “Veterinarians Day”, every year on November 11th. (Hmmmm … I think that’s a different kind of “Vet” sweetie). So here’s to Emma and her future …. Thank you for the nice note Emma. I took a quick look around while I was here and found your tooth under the table so I took it with me to add to my collection. Here are a few dollars for you. Have a great day at school! Emma didn’t seem too concerned or even accuse The Tooth Fairy of lying. She is the one who came up with the idea that The Tooth Fairy must have found someone else’s tooth and “mistook” it. She also told me that although she was leaving her tooth under her pillow with a note she did not expect to get paid again since that wouldn’t be fair. She just wanted to make sure to get her tooth to The Tooth Fairy so there wouldn’t be any confusion. Ethan wasn’t so sure about her honesty and suggested that maybe he should leave the tooth under his pillow and see if The Tooth Fairy would leave him money. Nice try Ethan! This helped calm Emma down a little and she said, “Yeah, just like the time Drew threw his tooth in the trash.” She was referring back to when Drew lost his first tooth. He had been eating a hotdog when he came running into the kitchen and said (with his mouth full of chewed up hotdog), “Mom, there is something hard in my hotdog!” Well, you never know with hotdogs so I just told him to spit it out in the trash. Later that afternoon we were waiting in line at Wal-mart and Drew was showing me all the all the things he “needed” in those nice little racks in the checkout lines when I noticed something different about his mouth. “Drew – look at me and smile” He looked up at me and gave me a big cheesy grin and I saw that little gap in his mouth. “You lost a tooth! When did you lose a tooth?” Drew just shrugged his shoulders and started feeling the hole with his tongue “Cool!” he said with a smile as he went back to looking at all the candy in the racks. All of the sudden it dawned on me … The hotdog! “I bet you lost your tooth when you were eating that hotdog at lunch, Drew. That was what the hard thing in your hotdog was!” Drew thought for a second and said, “But how will I put it under my pillow? We need to go home and find it. I bet we could dig through the trash and find it.” The thought of digging through the trash was not very appealing to me so I suggested that maybe we just write a note to the Tooth Fairy. The difference between Drew and Emma’s experiences is that the Tooth Fairy was a lot younger and less forgetful when Drew lost his tooth in the trash than when Emma misplaced her tooth. Also, I (umm … I mean the Tooth Fairy) only had one child and not four to keep up with. When Emma woke me up at 7:00 am on Friday morning with her Tooth Fairy Trauma I was half-asleep and more than a little overwhelmed since I realized I should have been up a half-an-hour earlier and that I had fallen asleep before performing my Tooth Fairy duties. I tried to think fast but all I could come up with was some lame excuse about the note we had forgotten to write. Emma argued that she thought the Tooth Fairy left the money where ever the tooth was so she wanted to look under tables, chairs and couches for the money she was sure the Tooth Fairy had left. However, since we were already running late I told her we didn’t have time to call out a search party for the money and / or tooth but that we could write a note when she got home from school and try again Friday night. I even promised to send an email to the Tooth Fairy since mommies have email addresses and cell phone numbers of all the important people in the world (The Tooth Fairy, The Easter Bunny, Santa Claus, etc) Emma finally agreed and off to school she went. Friday night we wrote a nice note to the Tooth Fairy, placed it under her pillow and like magic there was money in its place when Emma awoke on Saturday morning. Emma was very pleased and happy and all order was restored to the universe … well, at least in our household.